DOCTOR I AM HAVING TROUBLE PASSING WATER! 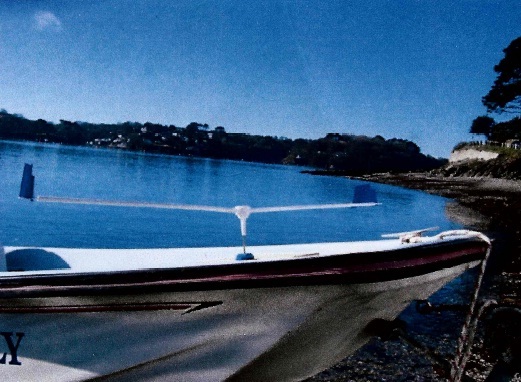 Out of site out of mind, bit like the organs in our bodies, however the impeller in the water pump attached to the engine of your boat does perform a vital function, circulating water round the engine. We advise that it is changed on a regular basis (especially if your engine is left to stand for a long period of time in the off season) & always carry a spare! Genuine Jabsco, Volvo, Johnson, Nanni & Yanmar impellers for inboard engines are stocked in depth, we also carry spare impellers for Mercury & Yamaha outboards. 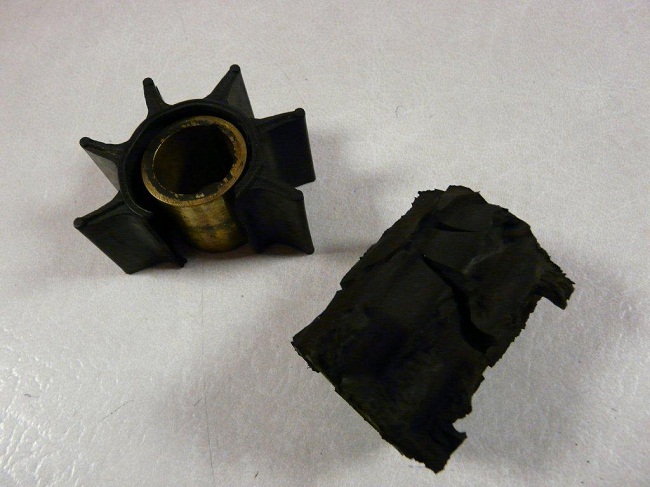 A word of warning however, don't be tempted to buy a cheap copy of the genuine article, you may save a few pounds in the short term however the impeller below lasted twenty minutes before causing over a thousand pounds worth of damage, never mind the lift in/lift out! When an impeller starts breaking up shedding lobes and the cooling circulation ceases, it's not just that the engine shuts down while you are on a lee shore or in the midst of a tricky maneouvre, but that when you get around replacing the impeller you have to worry about where all the bits went and what cooling passages they are now blocking. This entry was posted in Tips and Advice and tagged Jabsco, Johnson, Mercury, Nanni, Volvo, Yamaha, Yanmar on August 29, 2012 by Iain Forrest. It's not often I take away books of a nautical subject on holiday, it then becomes a bit like a busman's holiday, but with me flying out to 'cruise' the Greek Isles this week I am I must confess sorely tempted with these two! 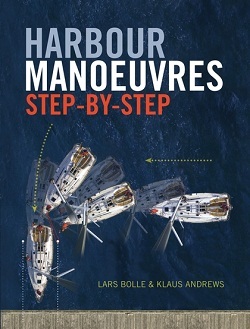 Harbour Manoeuvres Step by Step is excellent & probably the first of its kind & Tom Cunliffe's Expert Sailing Skills is another that has me tempted. Our prices: £19.95 for the Harbour Manoeuvres & only £17.95 for the Cunliffe book! This entry was posted in New Products and tagged Adlard Coles, Wiley Nautical on August 28, 2012 by Iain Forrest. Rob Storrar will be exhibiting the revoultionary Storm-Bag storm jib. This innovative sail is easily hoisted from it's own stowage bag around a furled headsail, thereby avoiding the need for an inner forestay. It is quick and simply brilliant! See us on Stand F026. 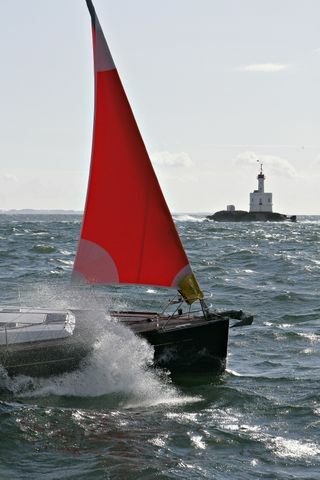 This entry was posted in New Products and tagged Southampton Boat Show, Storm-Bag on August 24, 2012 by Iain Forrest. Well this past Wednesday I thought we may be in with a chance, it was blowing over 20 knots when we started & with no other Melges on the start line, I thought I saw the chocolates on the horizon. We won the start with a little help from Ali & his Optimum Time watch, were first round the windward mark & from then on we seemed to increase our lead, or so we thought. All the other yachts decided to ‘white sail’; no kites except ourselves who for once flew the asymmetric with not to many duff gybes. Imagine my horror when the results were posted later that night.... 2nd to a white sailed J80! Never mind, a good time was had by all, especially guest jib trimmer Pete, who more used to cruising his Breehorn 37 in the summer (& with that breeze at the start of the race) opted for his Henri Lloyd Gortex offshore jacket & trousers, as the race progressed he got hotter & hotter & his face started to glow, bet he enjoyed his first pint in the club ship later that night! This entry was posted in Race News and tagged Henri Lloyd, Optimum time on August 24, 2012 by Iain Forrest. ALRIGHT FOR SOME . .
And I thought we were doing well, this Sunday we are flying out to Greece to spend a week on a friends ketch rigged Oyster, so I thought I would e –mail one of our regular customers whom we knew & our hosts had met last year, and I thought were in the same area as where ‘Nimrod’ would be berthed, so I e- mailed them & this is the reply I got! "Hi there, Won't be able to catch up this year. Fulfilling another dream. Riding across America on a Harley D. from Boston to Vancouver then down to Oregon to visit friends the turning east back to Boston. 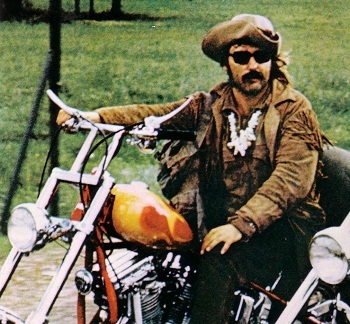 Have already completed 5,500 miles and expect to do the same again. Having a wonderful, amazing, even to quote the local vernacular, awesome time. Best wishes. Fair winds and calm (ish) seas. " Must remember to pack my Musto sunnies, my two pairs of Henri Lloyd’s excellent Octane Windstopper shorts (as well as buying some gin at Manchester airport) must not forget the spares for Nimrod, including a Jabsco 24 volt macerator pump, Aqua filta & a couple of spare 24volt mast head bulbs, methinks I will be climbing masts as a penance! This entry was posted in General Interest and tagged Henri Lloyd, Jabsco, Musto on August 23, 2012 by Iain Forrest. 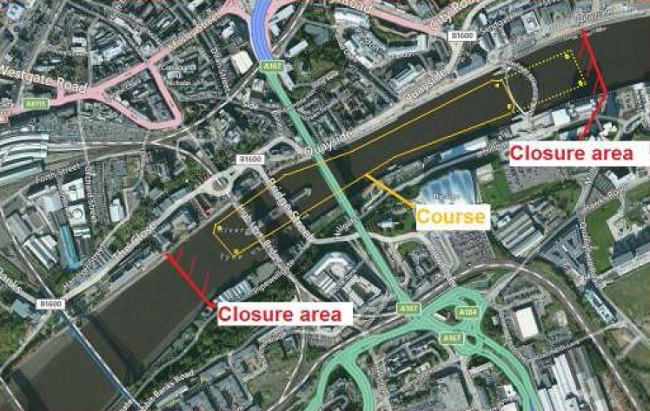 This entry was posted in Race News, Safety and tagged Port of Tyne on August 22, 2012 by Iain Forrest. 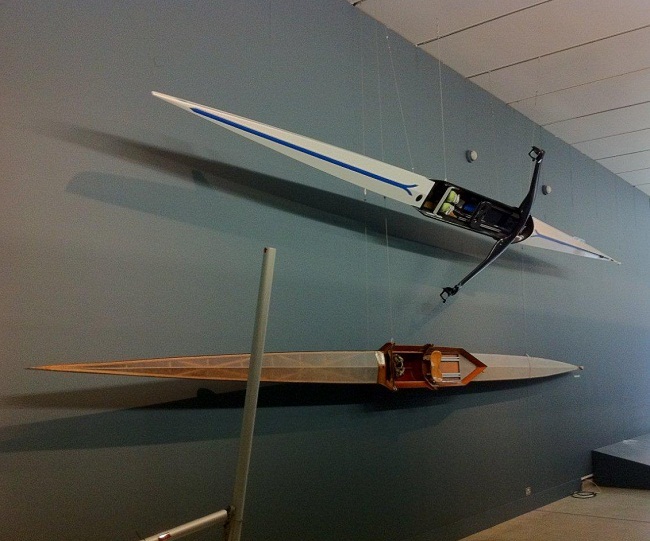 Ritchie our intrepid rigger was down in the London the other day, working at the Design Museum which I gather is next to Tower Bridge, his mission to get a high tech carbon rowing scull to 'appear' to float in air (cos it's so light). Anyway there was a change of plans & he ended up hanging both old & new. Components used included Wichard Eyebolts, Sta-lok terminals & Kos stainless wire. Due to the change of plans it meant he did not escape till five that evening, however his joy at eventually finishing the project was shortlived as just as he exited the building, Tower Bridge was lifted & there he was stuck in a monster traffic jam! Shame they didn't let him borrow the Audi to help him up the road! This entry was posted in General Interest and tagged Wichard on August 22, 2012 by Iain Forrest. One of our local customers who’s Sealine 425 is moored on Windermere was in the chandlery today singing (was going to say tweeting) the praises of the ‘Scare Gull’ . He has fitted two & says his is the only boat in the vicinity that the gulls don’t alight on! 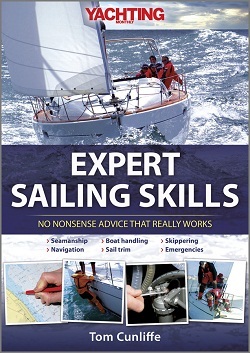 It’s a great bit of kit he tells us, much less time spent keeping his boat clean, more time spent on the water! This entry was posted in New Products and tagged Scaregull on August 20, 2012 by Iain Forrest. If you have by chance been offered a Henri Lloyd TP2 Shadow Smock in X Large at a ‘knock down price’ it may well have been the one that was ‘knocked off’ from our chandlery ie removed at high speed by one of the more undesirables that occasionally come ‘looking for bargains’ in our emporium! This entry was posted in General Interest and tagged Henri Lloyd on August 20, 2012 by Iain Forrest. After my disastrous race on Wednesday the 8th of August (don’t ask us how we finished) with no wind & not the best of beats, my prayers for a windy race on the 15th seemed to have been answered with a forecast of a four to five from the South East, however when we got down to Blyth it was more like six to seven gusting eight, direction was correct! & then there was the rain.... horizontal. On went my trusty Gill KB1 Racer smock & KB1 Racer trousers, Sealskinz ankle length socks & I slipped on my Henri Lloyd Deck Grip Profile trainers, took one look over the sea wall & thought the race will be cancelled! However driving back along the coast, the rain stopped the wind dropped & I thought another of Storrar’s bad calls! However by the time the race was scheduled to start the wind had returned with a vengeance as had the rain & cars were using headlights! Was please to find out next day that yes the racing had been cancelled & happy that I had started on our September newsletter. 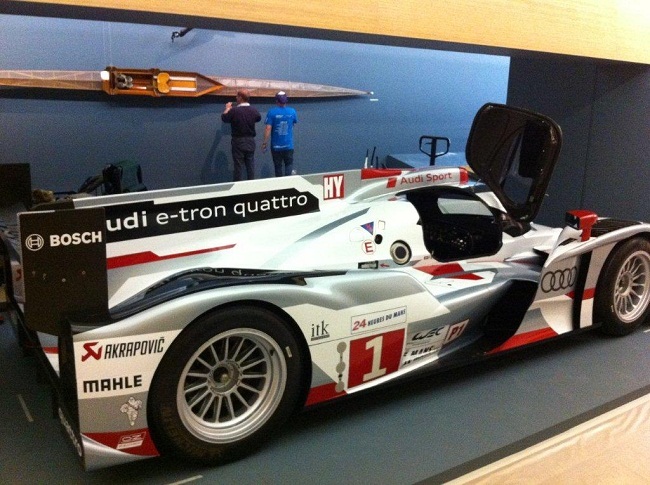 This entry was posted in Race News and tagged Gill, Henri Lloyd, Seaskinz on August 20, 2012 by Iain Forrest.